An Overview of the Emirates Salon Culinaire 2019. The Emirates Salon Culinaire (ESC) is a series of practical and display-based culinary competitions; entry to which is open to professional chefs, pastry chefs, cooks, and bakers. Some of the competitions are designed for entry by a single competitor; others are designed as team events. Each competition is called a class. Each class of the various competitions is intended to test the differing skills of entrants whilst also celebrating the preparation and presentation of food and its accoutrements in attractive and pleasing forms. There are few things more stimulating or heartening than to receive tribute from one's respected peers and seniors. 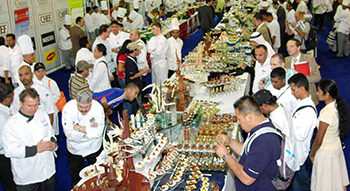 Accordingly, the competitors at the salon are judged by a panel of 20 international adjudicators, each one of whom is an approved international judge of the World Association of Chefs Societies (www.worldchefs.org). To any member of the general public fortunate enough to observe it , the Emirates Salon Culinaire is a visual extravaganza of culinary showpieces and practical cookery demonstrations: exciting ice carvings; intricately decorated buffet platters; spectacular pastry and chocolate creations; picture-perfect, aspic-preserved, platters of all manner of edible delights: Wedding cakes; celebration cakes; works of genius in spun and blown sugar: in fact, a seemingly endless presentation of gastronomic masterpieces. All this - coupled with three days of real-time, hectic, and thrilling cookery competitions - fought against the constraints of time, makes the salon a stimulating event that will become a major attraction at the Expo Culinaire exhibition for Chefs, Bakers, Pastry chefs, and cooks. Emirates Culinary Guild is inviting all professional chefs to participate in the upcoming biggest culinary competition in the Middle East; The Emirates Salon Culinaire 2019.